I don’t know what to do. The instructions are unclear. User Agent is: Mozilla/5.0 (Macintosh; Intel Mac OS X 10_12_6) AppleWebKit/537.36 (KHTML, like Gecko) Chrome/68.0.3440.106 Safari/537.36. What part of the instructions isn’t clear to you? 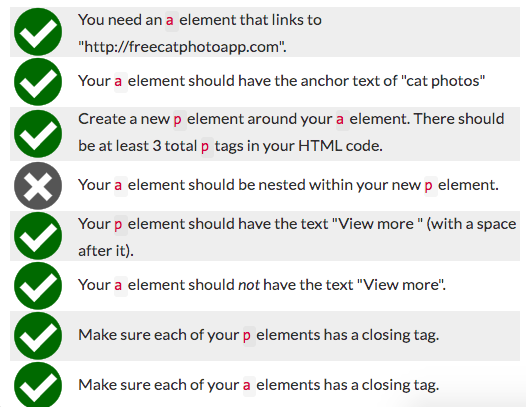 Now nest your existing a element within a new p element (just after the existing main element). The new paragraph should have text that says "View more cat photos", where “cat photos” is a link, and the rest of the text is plain text. @ChosenSiren6 Your code looks right to me. Which test(s) is(are) not passing? Hey @camper, would you mind if we used your animated gif to replace our current one shown below which the moderators use for explaining how to format code on the forum? I think your version provides a better example than our existing one (shown below). @ChosenSiren6 It looks like you added the nested link at the end. Nest the a element that is already present in the code at the top and delete the one you added at the bottom. Im sorry I don’t understand what you’re saying. What do you mean at the end and put it at the top? An example would e helpful. ok i got it! thanks.